Savory: an herb so bold and peppery in its flavor that since the time of the Saxons it has come to denote not only the herb itself, but also a whole segment of cooking. It is synonymous with tasty and flavorful foods. Once known as the poor man's pepper, sprigs of this herb will add a zesty taste and enhance the flavor of all meats, vegetables, and soups. Most commonly used as a seasoning for green vegetables, savory's special affinity is for beans. Use summer savory, with its more delicate flavor, for tender baby green beans, and winter savory to enhance a whole medley of dried beans and lentils. It is no coincidence that the German word for the herb is Bohenkraut, meaning bean herb, as one of the components of the herb naturally aids the digestion of these sometimes problematic legumes. Summer savory (Satureja hortensis) is the most delicate of the familiar varieties, both in taste and in character. It is an annual that requires light, rich soil and full sun, conditions that make it ideal for growing indoors. It will reach a height of about 1 1/2 feet and produces whorls of tiny white to rose flowers in late summer. The slender pale green leaves grow sparsely along delicate reddish stems. The stems themselves are square in shape, letting us know that they are related to the mint family. This is also evident in the aroma of the summer savory: a mixture reminiscent of both mint and thyme. Because the leaves are so tender they can be added fresh to salads or used as a toothsome garnish. One efficient way to preserve that fresh, summery flavor is to bottle the herb in vinegar at the height of the season. The ancient Romans were reported to have used savory vinegar as one of their main condiments as well as using savory liberally in their sauces. Savory also dries well. 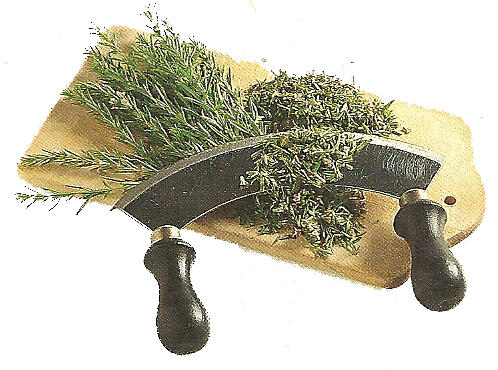 Once dried and chopped, it is an integral part of many herb mixtures, such as Herbs de Provene. This blend of Mediterranean herbs brings out the best in stews, vegetable dishes, pizza toppings, and shines as a seasoning for roasting meats, fowl, and fish. 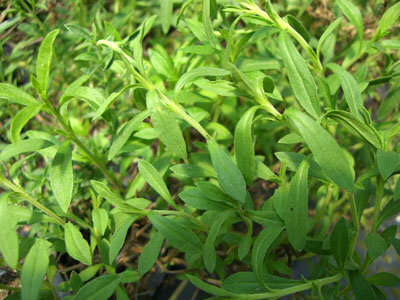 Winter savory (Satureja montana) is a coarser variety. Often used as a hedging plant in knot gardens of the Tudor era, it is a dense perennial shrub that grows to a height of 15 inches in well drained soil and full sun. The plant produces fragrant white to lilac colored blossoms that are attractive to bees. Virgil encouraged the planting of savory near one's beehives because of the wonderful flavor it adds to the honey. The leaves of winter savory are bright green, narrow, and tough. They are best used for dishes that require long cooking, such as stews, or added to the water when cooking dried beans so that there is enough heat and moisture to break them down. This not only releases the flavorful oils, but also softens the leaves so that they are palatable. Winter savory is often used in stuffing, with vegetables, as a seasoning for fowl, and in making sausages. 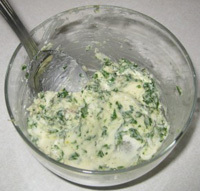 In fact, it is used today in the commercial preparation of salami. In California, most people have heard of Yerba Buena, the original name for the city of San Francisco. Few probably realize that the "good herb" (as the name translates to) is actually a variety of savory: Satureja douglasii. This low-growing, creeping perennial is native to the Pacific coast, thriving where it finds rich, moist soil. The early settlers learned to dry the herb and drank it as a tea to cure a variety of ailments, thus earning its name "good herb." Savory's popularity as a healing herb is nothing new. It has long been reputed to be a general tonic to the digestive tract, as well as a powerful antiseptic. Branches of the herb were tossed on the fire to create an aromatic disinfectant. Even today, because of its pungent oils, it is commonly used in toothpaste and soaps. One of the most interesting claims concerns savory's reputation as an aphrodisiac. It was the Roman naturalist and writer Pliny the Elder who, in the first century AD, gave the herb its name "satureja," a derivative of the word "satyr" (the half-man, half-goat with the insatiable sexual appetite). According to lore, the satyrs lived in meadows of savory, thus implying that it was the herb that made them passionate. This belief persisted over the years, and even as recently as this century noted French herbalist Messeque claimed savory was an essential ingredient in love potions he would make for couples. As a boy his father told him it was "the herb of happiness." With such a reputation, both in the kitchen and in the bedroom, savory is definitely an herb to keep on hand. Savory compliments all types of bean dishes. It makes other legumes and hearty meat and fish dishes more flavorful. Savory tea can help soothe cramps, stimulate digestion, alleviate diarrhea and relieve stomach complaints that are caused by intestinal gas. Pour1 cup of boiling water over 4 tsp. of savory. Cover and steep for 10 min. ; then strain. Drink 2-3 cups daily. Sugar may upset the stomach,so do not use it. 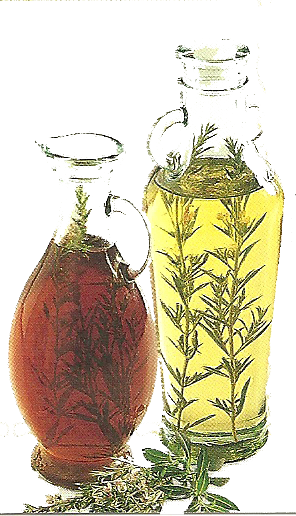 The fresh herb can be frozen or preserved in a bottle filled with oil and vinegar. Melt butter and add savory. Brush on poultry, fish, spare ribs, or roasts.